If you have a Wordpress website, you know that there are thousands (54,355 to be exact) of plugins to sift through. No one has the time to go through each plugin and try them out to see how well they work. That’s why we put together this review of 6 social media feed plugins for Wordpress and some of their best features. If you’re looking to add your social networks to your website using beautiful social media feeds then you have lots of great options to choose from. The social media feed plugins we reviewed each support social media feeds that integrate Facebook, Twitter and Instagram. Some of the social media feed plugins support even more social networks to choose from. 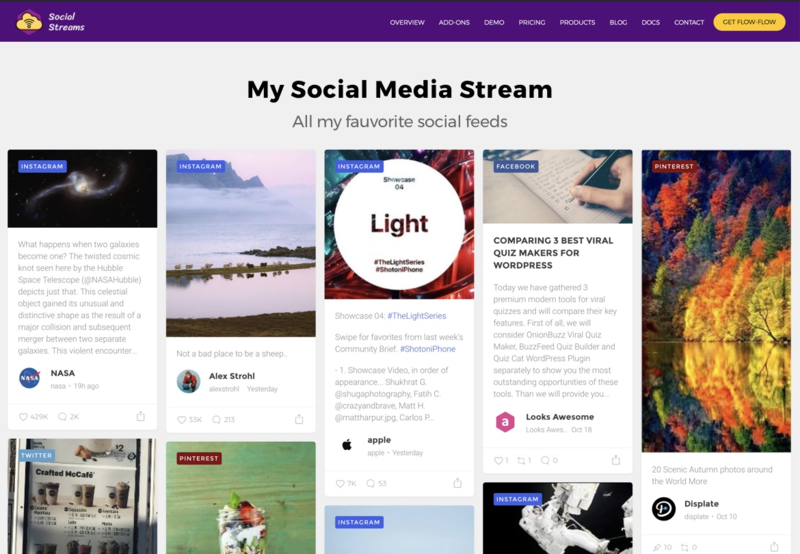 Flow-Flow Social Stream is a free plugin that offers social media feed integration with 15 different social networks including Facebook, Twitter, Instagram and Pinterest. The Flow-Flow Social Stream Wordpress plugin has a responsive layout, is optimized for any screen size and has a user-friendly admin portal for setting up your social media feed. The EmbedSocial social media feed plugin is a free Wordpress plugin that allows you to integrate Facebook, Twitter and Instagram posts into a social media wall on your site. You’re also able to integrate your Google and Yelp reviews into a social wall on your site. You can choose the images that are shared by an album on Facebook, choosing a specific hashtag or just linking your account to share all your social media posts. EmbedSocial also has another Wordpress plugin called EmbedStories for sharing your Instagram stories on your website. 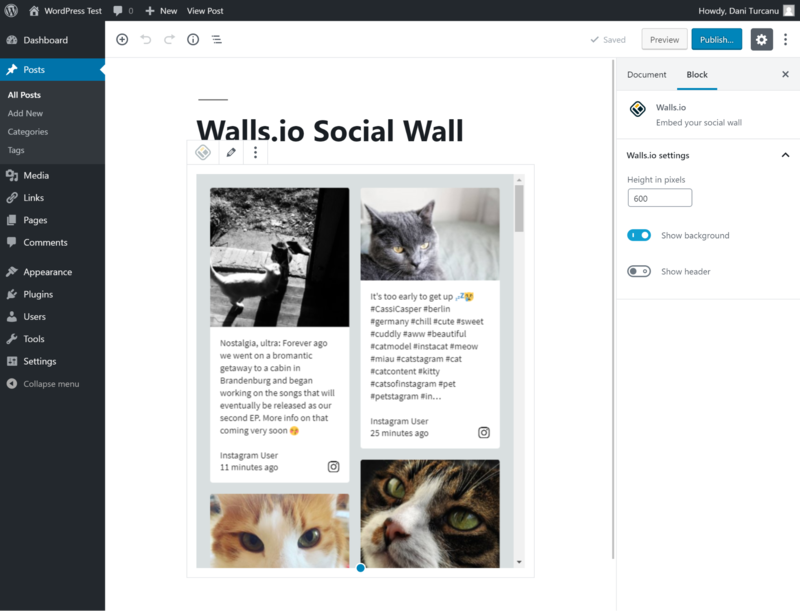 Another free Wordpress social media feed plugin is Walls.io’s Social Media Feed. 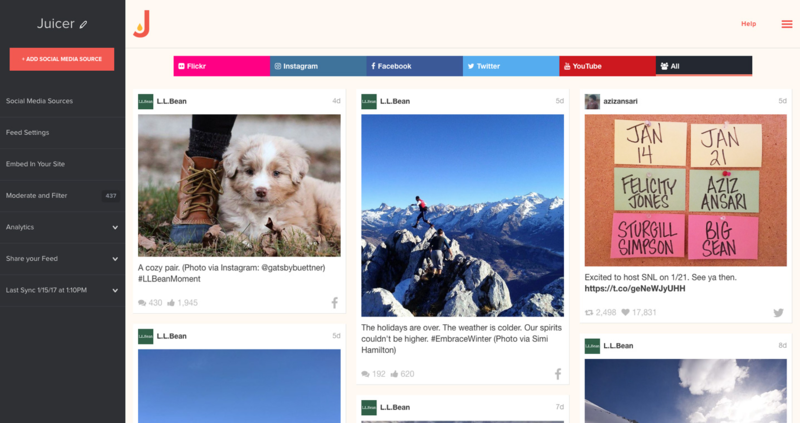 Walls.io offers integration with 16 social networks including Facebook, Twitter, Instagram and Pinterest. The Walls.io plugin has a number of different design themes to choose from, spam detection for the posts displayed on your social wall and a responsive, mobile ready design. The content you can add to your social wall can even be customized to feature any information you want including interesting company facts, upcoming events and more! Curator.io has a free social media feed plugin for Wordpress that supports Facebook, Twitter, Instagram, Vine, Tumblr, Flickr, Pinterest, Google+, YouTube, LinkedIn and RSS. 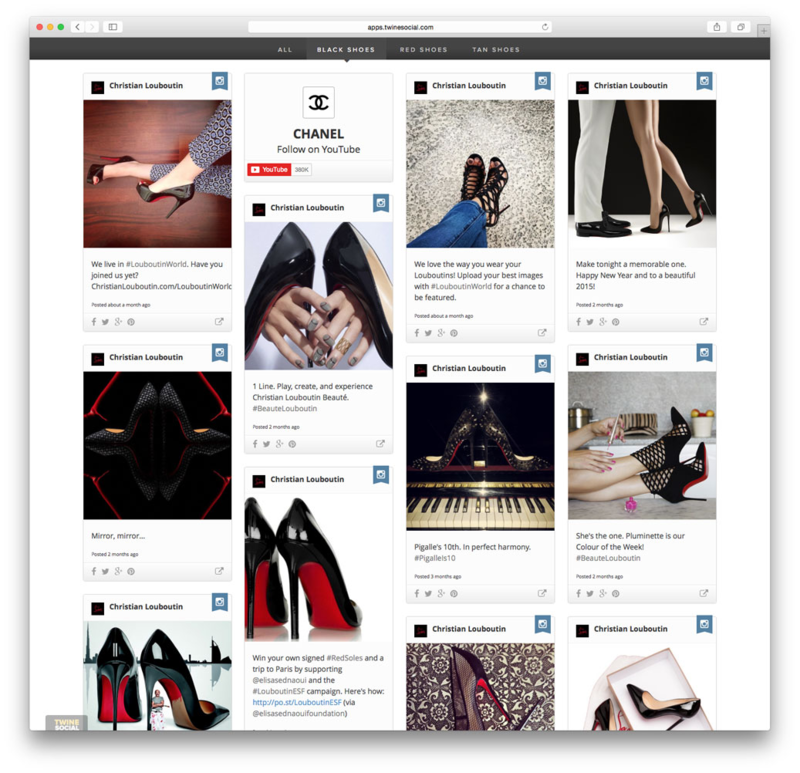 The Curator.io social media feed gives you free rein to customize your social media feed to look however you like including adding branded elements. You can select and sort the content that you want to display on your social wall by username or hashtag to filter the social content any way you like. The TwineSocial free social media feed plugin for Wordpress allows you to connect your social media accounts from Facebook, Twitter, Instagram, YouTube, Vine, Flickr, Pinterest, Tumblr, Linkedin, and RSS feeds. TwineSocial’s social wall also lets you sort the content you wish to display by @username, #hashtag, location, and more. 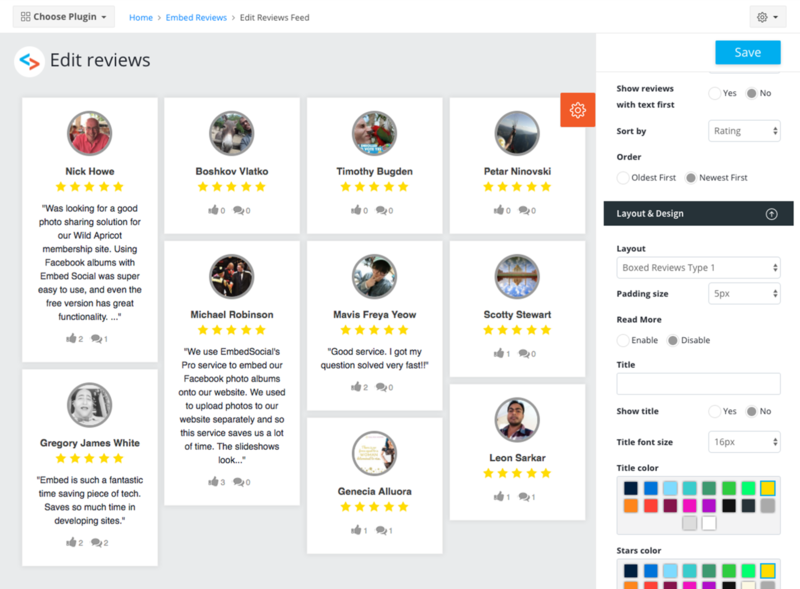 You can also group your content by categories (Press Reviews, Blog, News, Products, Events) and then display a social feed of one of your groups on a specific page on your site. Our free social media feed plugin for Wordpress allows you to build your social wall using your accounts for Facebook, Twitter, Instagram, YouTube, Google Plus, Tumblr, Pinterest, Tumblr, Vine, RSS, Spotify, Slack, LinkedIn, Flickr, Vimeo, Hashtags, Yelp and DeviantArt. The social media feed content can be customized by @username or #hashtag and you can setup rules and filters to sort out any unwanted content. The custom CSS enables you to customize the design of your social media feed including adding branding or a design that fits your website’s style. While there are many free Wordpress social media feed plugins to choose from, these 6 are certainly the best of the best when it comes to features, supported social networks and social feed customization.